One SLO city resident is done dealing with a sorority in his neighborhood. He emailed a litany of complaints to the city about rush activities at Kappa Kappa Gamma’s (KKG) sorority house on Osos Street, highlighting how Cal Poly’s Greek life sometimes doesn’t mesh well with residential neighborhoods. 1716 Osos St., which he says have disrupted his neighborhood with excessive noise and a hectic schedule of charter buses chauffeuring recruits to and from the sorority. QUIET DOWN: Complaints from a SLO resident about the Kappa Kappa Gamma sorority house on Osos Street raise questions about how Cal Poly Greek life meshes with residential neighborhoods. The city responded on Sept. 16 by saying it would investigate the matter. SLO Community Development Director Michael Codron told New Times that the city is in touch with KKG about the recent complaints. The city declined to provide emails to New Times between the city and the sorority without receiving a formal public records request, which New Times filed on Sept. 29. KKG and its 10 members moved into the former Sanitarium bed and breakfast near the train station in fall 2013. The sorority received one citation for a noise violation in September 2014. During that month, SLO police were dispatched to the house four times on noise complaints and once for a traffic hazard. Police have been called to the house a total of 12 times since fall 2013. Police calls for September 2016 were not available. Kathryn O’Hagan, coordinator of Fraternity and Sorority Life at Cal Poly, said KKG members make an earnest effort to connect with the neighborhood, respect residents, and work within the rules of their agreement with the city. The 2013 agreement stipulates that the sorority must host no more than 15 people for “routine” gatherings. Any gatherings on site that exceed 15 must be submitted to the city for prior approval. O’Hagan said KKG follows all those conditions and submits its larger events, like those during rush week, to the city for review and approval. 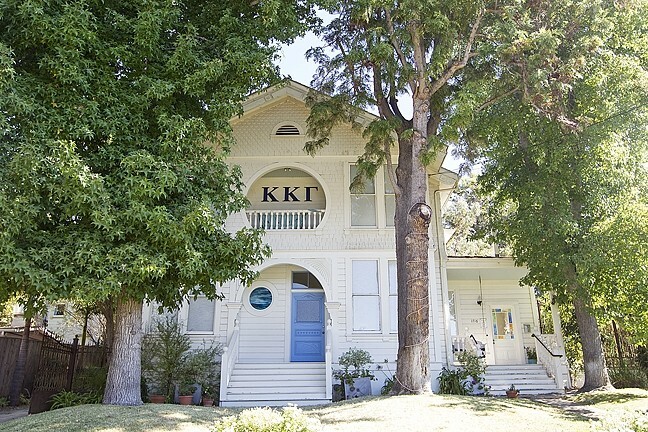 KKG is one of 36 Greek chapters—not all of which have a house—at Cal Poly, and the number of fraternities and sororities associated with the university is growing. On Sept. 28, the SLO City Planning Commission granted approval for a new Alpha Gamma Delta sorority house at 190 Stenner St. in the Anholm neighborhood. Cal Poly. Delta Gamma is the next sorority lined up to join the community in winter 2018. There is also an eight-year plan to bring in one new fraternity chapter to Cal Poly every two years. Neighborhood conflict between students and full-time residents is nothing new in SLO. Any student housing embedded in a residential neighborhood presents a potential for conflict, Codron noted. “It’s the reality of living in a neighborhood where you have different populations,” he said. The city defines sorority or fraternity houses separately in its zoning code under “group housing” or houses with five or more adult inhabitants. It’s a way to funnel incoming sorority or fraternity houses to appropriate locations. The Planning Commission vets all the new proposals. “We just try to make sure that, operationally, it works in a way that minimizes the impact to surrounding properties and residents,” Codron said. Students are encouraged to meet their neighbors face-to-face and provide names and phone numbers to establish a friendly method of accountability. When good faith collapses, the rules and regulations are already in place and the city has a right to review a sorority or fraternity lease if violations accrue. Codron said the city has tightened the rules for sororities and fraternities in recent years. Housing agreements with older fraternities have looser regulations than agreements with the newer chapters, like KKG. Alpha Gamma Delta, the incoming sorority on Stenner Street, was given the same 15-person restriction as KKG for routine gatherings. The result of that is many long-established Greek houses don’t have the strict guest cap that others do, which has raised the question of fairness. But O’Hagan encourages students not to look at it that way. The impact of Cal Poly on the local housing supply has been hot topic in the SLO City Council election season. Many of the candidates have taken firm stances that the city should be putting more pressure on Cal Poly to house its students. Cal Poly’s long-term goal is to house 65 percent of its students on campus. Plans for an on-campus Greek community have been discussed, but haven’t been included in the Cal Poly Master Facilities Plan. “It’s been a topic of discussion, but no formal plans are underway,” O’Hagan said.